During a Tuesday address to the University Council, UND President Mark Kennedy reviewed a long list of University successes of the past year and plans for the future, using the seven goals of the new One UND Strategic Plan as a framework. Photo by Jackie Lorentz. 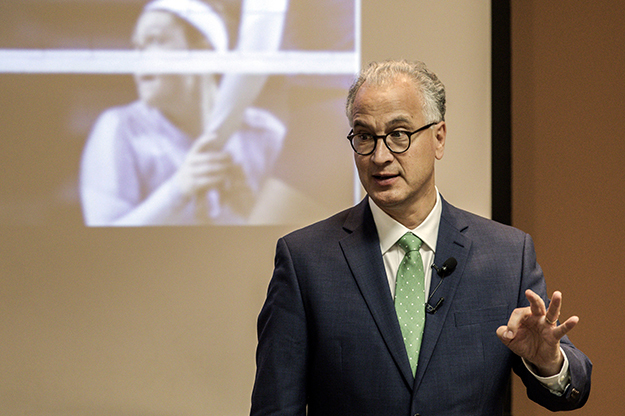 UND President Mark Kennedy was still buzzing about a big win by the Fighting Hawks volleyball squad last week in Mississippi as he stepped up to deliver his official address to the University Council. He reminded his audience how the Fighting Hawks pulled off a remarkable come-from-behind 3-2 victory over Ole Miss of the Power 5 Southeastern Conference on their home court. UND staved off five consecutive match points from Ole Miss to position itself for the kill shot, a service ace from the Hawks’ defensive specialist Alivia Fraase. Word is, after the game, Kennedy sent a friendly note to his counterpart at Ole Miss., thanking the hosts for their hospitality and the win – one flagship to another. During his Tuesday address, Kennedy used the on-court resilience of the volleyballers as a metaphor for the University and the successes it’s achieved in the face of daunting obstacles over the past year. 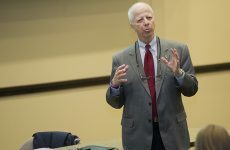 Kennedy then rattled off a series of successes of the past year and plans for the future, using the seven goals of the new One UND Strategic Plan as a framework. of Arts and Sciences—one of the country’s oldest and most prestigious societies of leaders from academia, the arts, business and public affairs. Photo by Jackie Lorentz. Mark Trahant – Early in April, Mark Trahant received an email from the American Academy of Arts and Sciences, announcing that he had just been elected as a new member of the Academy—one of the country’s oldest and most prestigious societies of leaders from academia, the arts, business and public affairs. Marcus Weaver-Hightower and Sheila Liming – Sheila Liming, of the Department of English, and Marcus Weaver-Hightower, with the Department of Education Foundation & Research, were presented with a North Dakota University System award for incorporating technology in the classroom. Revamped and newly named Columbia Hall – The newly named Columbia Hall, formerly the School of Medicine & Health Sciences, located on campus on North Columbia Road, includes a new headquarters for Communication and a DigiComm Lab to, in part, help develop even better public speakers; expanded space for Honors; and new synergies in the Department of Psychology. Upgrades to O’Kelly Hall – Investments in O’Kelly Hall, in the heart of campus, has allowed for the creation of a Math Active Learning Lab, or MALL, providing student-centered curriculum and learning space to meet a growing challenge for undergrads. High-Impact Practices – Five representatives of the UND College of Arts & Sciences went to Boston in June to attend the 2017 Institute on High-Impact Practices and Student Success, hosted by the Association of American Colleges & Universities. The focus of the competitive national program is helping campuses infuse high-impact practices into their curriculums. Some reverberations of that visit already are being felt at UND with increased internships with the City of Grand Forks; the formation of a Big Ideas Gymnasium at the College of Engineering & Mines, where undergrads are collaborating on real-world problems; and UND Theatre Arts’ debut of Shakespeare on the Red, in which young thespians work alongside seasoned veterans of the theatrical arts. Frank Swiontek (right center), UND interim associate director for Institutional Effectiveness, discusses University data with analyst Dana Morehouse. 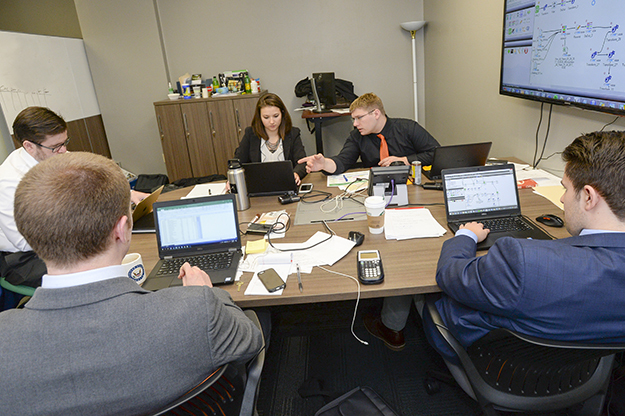 David Flynn, chair of the UND Department of Economics and Finance; and Sean Cleary and John Mitzel, both data analysts, join them at the work table. Photo by Jackie Lorentz. Participation in Starfish – UND is making progress in increasing the number of students participating in an online analytics program that helps faculty monitor students’ progress and looks for warning signs in students who might need intervention. UND had set a goal for 65 percent participation, but according to recent data, the University surpassed that mark by six points. Revamped Office of Institutional Effectiveness – The office has made a comeback under Kennedy’s guidance and leadership, providing the kinds of analytically-based decision making that is helping the University drive up graduation rates. 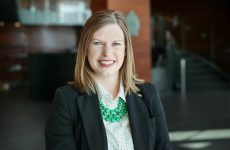 Eliminating barriers – UND Registrar’s Office has knocked down barriers to timely graduation by establishing the opportunity to graduate with 120 credits and allowing “double counts” so students can pursue multiple degrees in a way that promotes cross-pollination in different areas of study. Lynette Krenelka, (left) director of UND Extended Learning, and Anne Kelsh, (right) program director for Instructional Development, take part in a recent seminar, “Thinking Strategically: Planning for Online Degree & Certificate Program Development.” Photo by Jackie Lorentz. 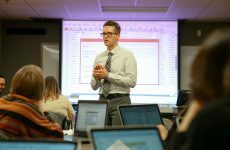 Online rankings – UND College of Business & Public Administration online courses continue to rank among the best in the nation, signaling the quality of UND’s distance curricula. 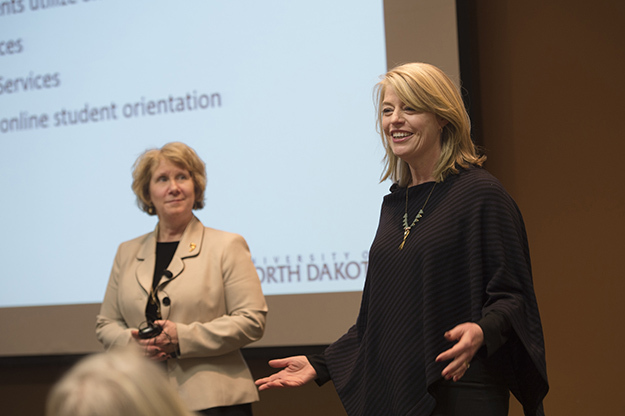 Online training – Lynette Krenelka, director of UND’s Office of Extended Learning, and Anne Kelsch, program director for Instructional Development, held a seminar last spring that walked faculty through the process of offering online courses. High-growth programs – UND will continue to invest in and nurture high-growth programs such as those related to unmanned and autonomous systems, computer sciences, cyber security and analytics management and analysis. 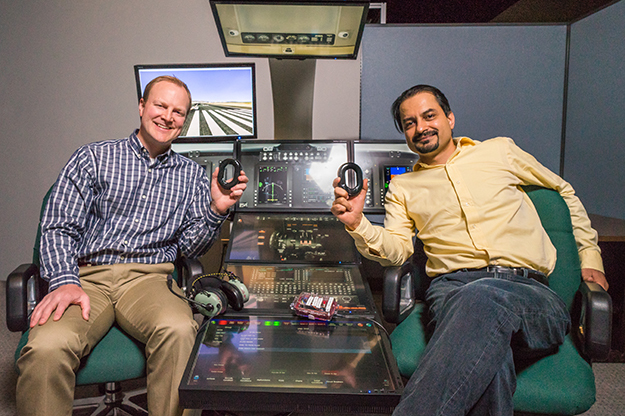 UND Assistant Professor of Aviation Nick Wilson (left) and UND Assistant Professor of Electrical Engineering Kouhyar Tavakolian show off components of their patent-pending “Smartsealz” communication headset, which contains embedded technology that monitors aircraft operational signals and pilot brain activity for signs of mechanical problems and pilot mental fatigue. Photo by Tyler Ingham. Nick Wilson and Kouhyar Tavakolian – Wilson, an assistant professor of aviation, and Tavakolian, assistant professor of electrical engineering, with the help of colleagues, students and private industry partner Rockwell Collins, invented “Smartsealz,” a patent-pending cockpit integration technology designed to alert pilots to dangerous situations by gauging an aircraft’s spatial orientation or the pilot’s physiological state or both. Vasyl Tkach – Parasitologist Vasyl Tkach recently was recognized by his peers as a top researcher in his field, not only for his groundbreaking work but also for his outstanding mentoring of students. The American Society of Parasitologists bestowed the Henry Baldwin Ward Medal on Tkach at its annual meeting in July. Ph.D. alumnus Stephen Greiman – Stephen Greiman, a 2015 UND Ph.D. graduate, received the American Society of Parasitologists’ 2016 Ashton Cuckler New Investigator Award, given to the most outstanding North American early career parasitologist of the year. Midwest Big Data Hub – UND, in partnership with Iowa State University, Kansas State University and the University of Nebraska-Lincoln, is leading a multi-institution Digital Agriculture Spoke grant of about $1 million from the National Science Foundation. RIAS – This past year, UND formed its new Research Institute for Autonomous Systems (RIAS, pronounced “Rise”), a highly collaborative initiative with the potential to further diversify North Dakota’s economy. RIAS was created to take UND to the next level to become a global leader in unmanned and autonomous research application and policy development. Rural health and opioids – Thomasine Heitkamp, professor in the UND College of Nursing & Professional Disciplines, recently was awarded a five-year grant totaling $3.8 million from the Substance Abuse and Mental Health Services Administration. The grant solidifies the University’s role as a regional focal point for the nationwide effort to combat abuse of opioids such as fentanyl, carfentanyl and others. Members of UND’s American Indian Science and Engineering Society chapter earned several honors at the Society’s most recent conference in Minneapolis. A few of the members pose for a group picture as they hold the chapter’s national awards from 2015 and 2016. (left to right) Cheyenne Defender, Dunseith, N.D.; Hannah Balderas, New Town, N.D.; Emily Falcon, Belcourt, N.D.; and Makayla Platt, Tacoma, Wash. Photo by Shawna Schill. 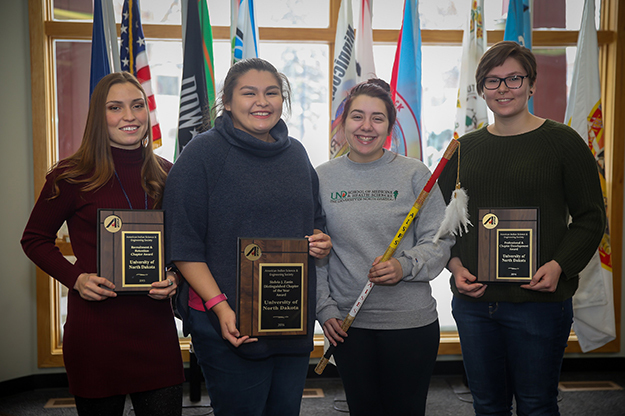 American Indian Science and Engineering Society Chapter – The UND American Indian Science and Engineering Society Chapter is used to doing things big, earning honors for national Distinguished Chapter of the Year and the national Professional Chapter Development Award. UND AISES members also were recognized with the national Recruitment & Retention Chapter Award in 2015. Building attendance at diversity events – Similar to ways UND has used Nodak Nation to increase student fan attendance at Fighting Hawks sporting events, a campus group is strategizing how to encourage more participation at campus cultural and diversity events such as the Wacipi Powwow and Culture Nights at the Memorial Union. Online degree opportunities – UND is exploring online learning opportunities that would appeal to active-duty service men and women and veterans. A number of promising areas include aviation, criminal justice, engineering and business degrees. In her August 22 State of the Foundation address, Carlson Zink announced that, during the Fiscal Year 2017 ending on June 30, the UND Alumni Association & Foundation rallied nearly 10,000 donors to help meet its $40 million fundraising goal. Photo by Sam Melquist. 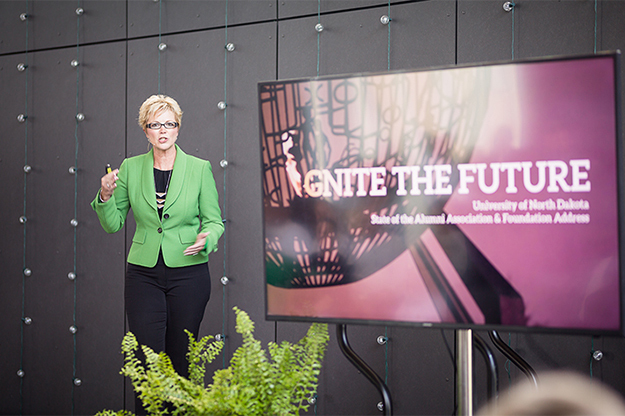 State of the Foundation – The UND Alumni Association & Foundation’s recent State of the Foundation address reported $40 million in donations from alumni and friends of UND – up from the low $30-million range last year. Fundraising for buildings – Emphases for private fundraising currently moving forward include the replacement of Gamble Hall, the headquarters for the College of Business & Public Administration, and renovation of the Chester Fritz Library. 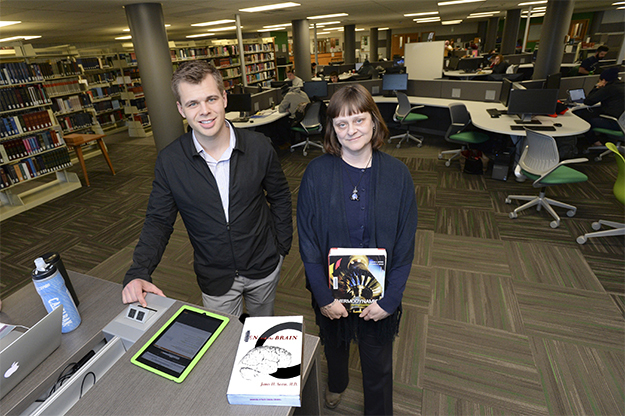 Former UND Student Body President Brandon Beyer (left) and UND Dean of Libraries and Information Resources Stephanie Walker are big proponents of Open Educational Resources, which have saved UND students millions in textbook costs. Photo by Jackie Lorentz. Moratorium on faculty hires – Provost Tom DiLorenzo has been working with the Budget Subcommittee of the University Senate on criteria that could lift the moratorium on new faculty hires. New VP for University Relations – This search is expected to be finalized in October. New Dean of College of Business & Public Administration – Dean of the College of Education & Human Development Cindy Juntunen is set to head up this search. VP for Finance and Operations – School of Medicine & Health Sciences’ Dr. Josh Wynne has agreed to lead the search committee that will help find a successor for current Vice President, Alice Brekke. Center for Innovation Director – Former UND Interim President and North Dakota Gov. Ed Schafer will lead discussions on next steps to fill the position of director of the Center for Innovation. 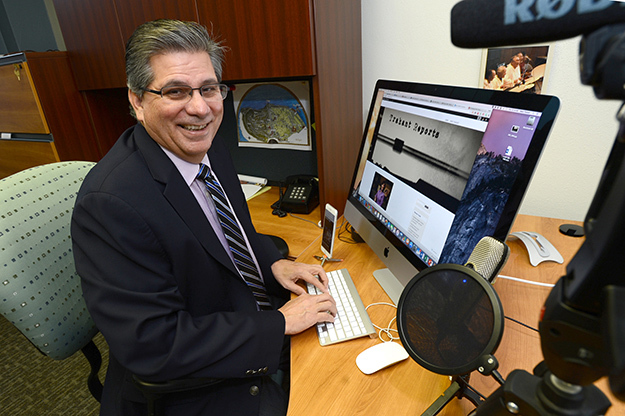 OER – Open Educational Resources have been embraced by UND. OER, often in the form of online educational resources versus expensive textbooks, is expected to save as much for students as recently approved tuition increases will cost them. New website rollout – A new, more interactive and platform-aware UND website is still in the works. The revamped web presence should be rolled out in April. It will be UND’s new face to the world and should significantly enhance the school’s ability to communicate with and recruit new students. Steam plant – UND is making progress in deciding the fate of the school’s steam plant — which sits prominently near the heart of campus – and how UND might contract out for such services. Master planning – A big effort will be made in the coming months to get a campus master plan to the State Board of Higher Education by February. A consultant has been hired to help with that process. Athletics – The Fighting Hawks had a big year academically and athletically. UND was the inaugural winner of the Big Sky Presidents Cup, an award based on combined successes on the field and in the classroom. For the fifth year in row, UND also had the highest collective academic scores of any other Big Sky Conference program. UND also won four major conference championships and appeared in the NCAA Men’s Basketball Tournament, playing to a television audience of 1.4 million.